Is Geospace Technologies Corp Destined for Greatness? Let's see what the numbers say about Geospace (GEOS). Investors love stocks that consistently beat the Street without getting ahead of their fundamentals and risking a meltdown. The best stocks offer sustainable market-beating gains, with robust and improving financial metrics that support strong price growth. Does Geospace Technologies (NASDAQ:GEOS) fit the bill? Let's take a look at what its recent results tell us about its potential for future gains. GEOS Total Return Price data by YCharts. 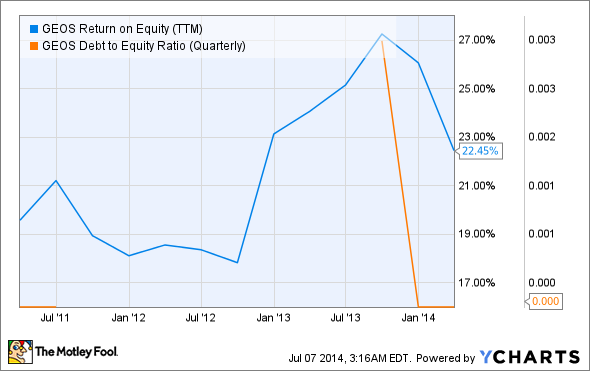 GEOS Return on Equity (TTM) data by YCharts. Geospace comes through with a strong showing today, missing out on a perfect score only because its free cash flow hasn't grown along with its bottom line. This has been an ongoing issue for Geospace, which has not recorded higher free cash flow than net income since the end of 2010. However, it's hardly insurmountable, and the progress on Geospace's other fundamentals makes it seem eminently possible for the seismic data specialist to reach a perfect score in the future. But how likely is it that Geospace will push its free cash flow higher in the near future? Let's dig a little deeper to find out. 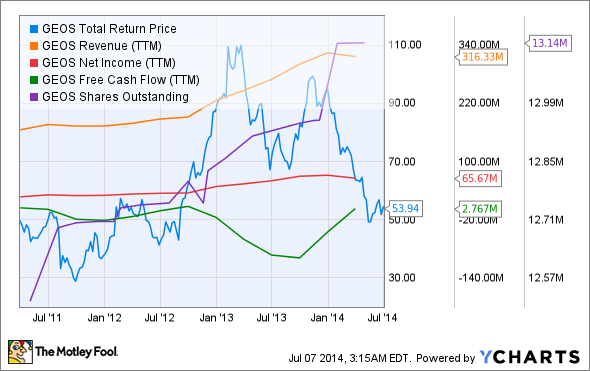 Geospace investors certainly haven't been rewarded for their faith in the company this year; Fool energy specialist Tyler Crowe highlights it as one of the worst-performing energy stocks for 2014's first half. Crowe points out that Geospace has been at the mercy of belt-tightening at Big Oil, as many of the world's largest offshore oil producers have been scaling back capital expenditures in recent quarters. This matches Geospace executives' rationale for the company's weak performance during its latest quarterly earnings call -- wireless product sales decreased because most sales were replacements or upgrades rather than new products. With the exception of major orders from Statoil (NYSE:EQNR), none of the world's largest oil companies were major customers of Geospace's seismic-products division either this year or during the year-ago quarter. Since the Statoil contract is wrapping up in the current quarter, Geospace expects seismic product revenues to "decline significantly" for the rest of its fiscal year, which might be putting it mildly, as Statoil accounted for over $0.70 out of every dollar in revenue recognized by the segment. Sources: YCharts and Yahoo! Finance. There's more than one way to value a stock, and in this regard, Geospace falls far behind its peers. Only Core Labs and Oceaneering merit lower expectations from Wall Street, but even Oceaneering's price to free cash flow ratio is barely a quarter of Geospace's. On the rare occasions when Geospace has reported positive free cash flow, its P/FCF has still typically been among the sector's highest -- it was last cheaper than either Core Labs or Oceaneering on this basis in early 2011. With these issues in mind, and when also considering Geospace's heavy reliance on a few major customers, it seems that the company's recent track record may not be an accurate guide to its future potential after all. Today, Geospace Technologies has many of the qualities that make up a great stock, but no stock is truly perfect. Digging deeper can help you uncover the answers you need to make a great buy -- or to stay away from a stock that's going nowhere.